Mandy's parents are countryside vets and Mandy is temporarily leaving Leeds to work with them in their practice. She and her boyfriend Simon are planning to set up their own practice in the future and Mandy would love to have more experience with bigger animals first. She's excited about her stay in Welford and getting reacquainted with her old friends is nice and feels exactly right. Mandy has that great sense of belonging while being in her old hometown. Mandy is busier than ever. However, things aren't all sunshine and roses. Simon wants Mandy to return to the city as soon as possible, so they can go ahead with the plans he's made for their practice. Mandy isn't sure if she's ready yet though. One of her best friends is terminally ill, so she has something else on her mind. She also still has to prove herself in the family practice, not everyone immediately accepts her presence there. Plus there's someone new in the village she has issues with. Will Mandy be able to deal with it all, so she can start working on making her dreams come true? Summer at Hope Meadows is a wonderful story. Mandy is a sweetheart. She's a great vet with plenty of patience and I really enjoyed reading about her love for the animals she works with. Being a countryside vet suits her and it was fun to read about her adventures. I immediately fell in love with Welford and its inhabitants. I'm a big fan of stories about animals and this is definitely a good one. Mandy is a fantastic main character, she's a true ray of sunshine. Reading about her experiences sometimes put a big smile on my face and it also made me tear up from time to time, which is exactly how I like it. Lucy Daniels's story is heartwarming and endearing. There is a lot going on and I adored the many surprising twists and turns. I read Summer at Hope Meadows in one sitting, I loved it so much that I couldn't put it down. The writing is smooth and open, the descriptions are vivid and colorful and I loved how everything comes to life in such a vibrant manner. 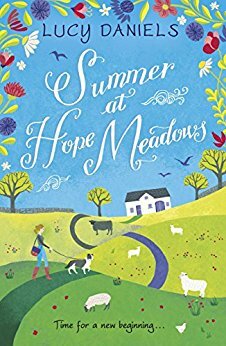 I highly recommend Summer at Hope Meadows, it's a gorgeous story filled with hope, joy, sweetness and light combined with the honesty of real life. If you love reading about small towns and animals and like strong heroines you should definitely read Summer at Hope Meadows. Sounds like a great story. I will have to check out the book. Thanks for the awesome review. Yes! Thank you so much for the review. Looking forward to reading about Mandy's adventures. For as long as I can remember I wanted to be a vet so I'd probably enjoy this! It sounds like Mandy is going through several trials of life at the same time. Great review, It sounds like a book I will read more than once.